Electric Bikes Conversion Kits EMTBS eRoad/Commuting What's New? Hats off to the OP, emjay, for such a comprehensive summary, all the makings of a permanent thread! The Universal Left & Right throttle is a long overdue item, avoids the expense of following the former "get a selection of throttles" advice. Maybe even combined with an 'Invisible Bell' one side and 'Brake & Shift Combo' Left or Right Lever with Grip for a single fitment each side.. This was by far the trickiest bit of the build process. I got the motor already built into a wheel, and the build quality was OK, nothing special. The spokes were very loose compared to what you'd get from a proper bike shop. Being quite light, I'm not too hard on spokes (i.e. have never broken one in many years of cycling) so I figured it would be fine. I will probably tighten up the spokes in the future when I get the right tool. I then took the disc rotor off the donor wheel and put it on the motor wheel. 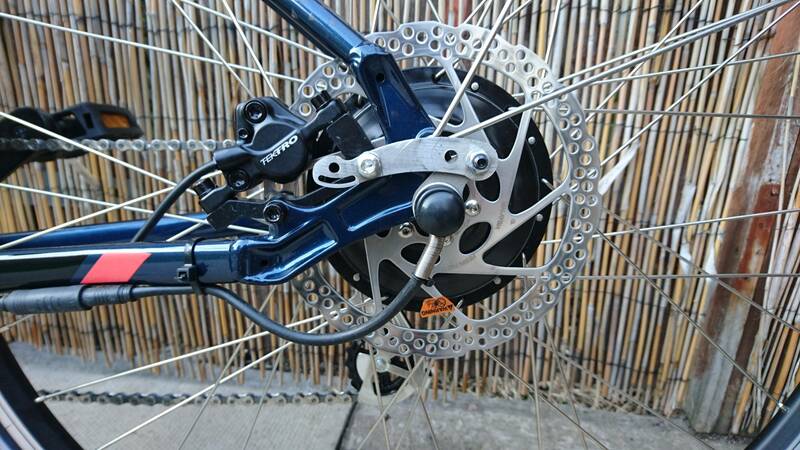 When I fitted the wheel into the dropouts, the casing of the motor hub was hitting the brake caliper. So I had to take the old 160mm rotor off, fit a new 180mm rotor, and fit a 180mm adapter to the frame to move the caliper further away from the hub. 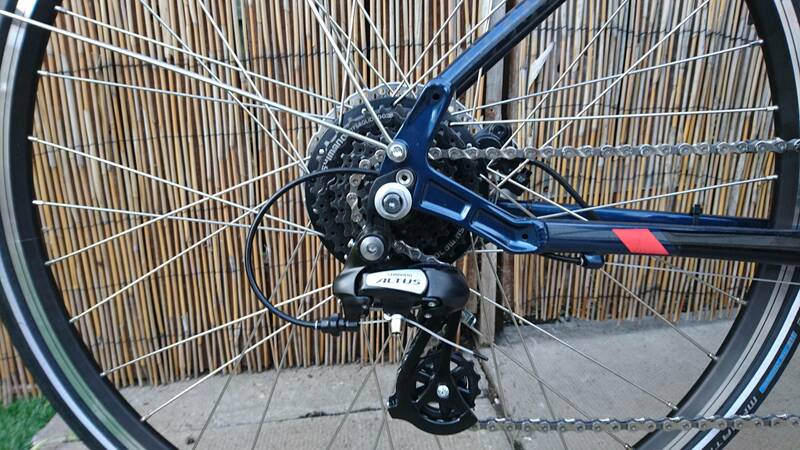 If you're planning a build like this, I suggest you plan to fit a 180mm rotor if the bike doesn't already have one. There are various other ways round the problem like filing down the caliper or fitting a low profile caliper, but changing the rotor size was easy and fixed the problem completely. Once I had the wheel sitting in the dropouts I noticed that they were a bit shallow and the axle was not sitting fully in them, so I filed the dropouts a bit with a round file. I noticed that the torque nuts supplied with the motor were nowhere near engaging with the dropouts - the dropouts were just too shallow. Filing them deep enough to allow the torque nuts to engage would have involved removing a load of material and leaving the dropout area of the frame very thin, so I just decided not to use the torque nuts and build a torque arm instead. I ended up having to use a longer M6 bolt to secure the second bit of the torque arm to the caliper mount. The bolt goes through the torque arm, then through a few washers to make it the correct distance from the frame, then through the caliper mounting hole on the frame and into the threads on the caliper adapter. As you can see in the photo, my torque arm isn't the neatest - there is a stray hole from a previous fitting attempt, and I should probably remove the unneeded bit at the end. 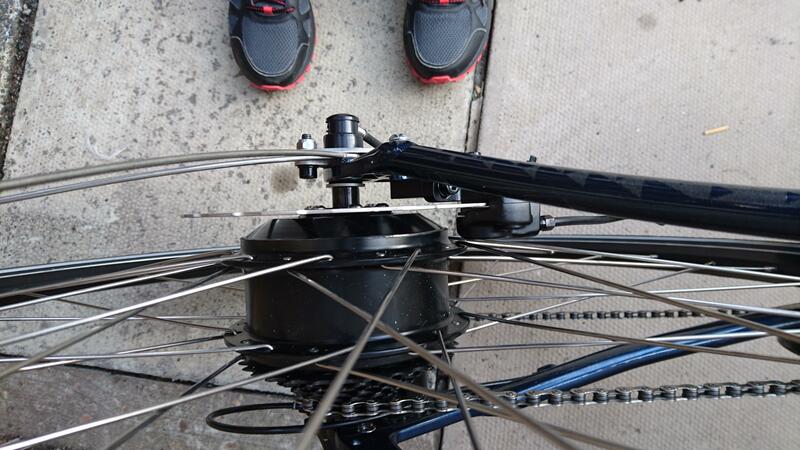 In the picture you can also see the stays for a mudguard, which I fitted at the same time I put the wheel on. The mounting hole for the mudguard stay is directly behind the torque arm, but I just sandwhiched the stay between the frame and the torque arm and the friction was enough to hold it in place nicely. I fitted the motor so that the cable emerges from the axle pointing down, which I think should make water less likely to run into the end of the motor. Tip: during the process of fitting the wheel I probably put it in and out of the dropouts dozens of times, so I removed the rear derailleur during fitting so that it was easier to just drop it in. Finally putting a torque arm on my bike. Shouldn't the torque arm be placed around the other way e.g per attached photo? The wheel is being driven forwards so surely the arm has to try and hold it back? I suppose it may. Not matter either way if rock solid though? In that pic the TA is only relying on the cable tie to hold it, if the axle did turn in the dropouts cable tie won't do much but snap or slide. Ideally the TA would be batter fitted rearwards and the spare frame/ mudguard eyelet used as anchoring or a homemade one piece TA. Norco Indie 2 700c BBS01(1), Big Bear BPM kit (2), Q128C (3) & KT kit, Bafang CST(4) & KT kit..
Boardman cx/mx Oxdrive kit(1) Bafang cst & KT kit (2), Q128C & KT kit(3), Yose CST & KT kit (4). 2 x Swizzbee 50c. (24V Heinzman brushed motor).